Ségou villages have been happy celebrating the end of the month of Ramadan. It has also been a double celebration, since finally after a long month of praying and waiting, it rained in this region of Mali. Even though it was long past due, the rains were a welcome sight to see. The rainy season, wintering, or “hivernage,” as it is known in French, refers to this period of time where farmers sow their seeds before cultivating. 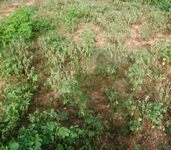 Unless there is a sufficient amount of water, usually through rains, then there is a risk that the crops would be damaged. It was a topic covered by the new bloggers from the Rising Voices grantee project Ségou Villages Connection. L'hivernage commence bien actuellement au Mali. Il pleut chaque jour. The rainy season has now started in Mali. It rains every day. On dit que l'abondance des lianes en début d'hivernage n'est pas un bon signe.Elle peut provoquer selon la tradition la rareté de la pluie. They say that the abundance of lianas at the start of wintering is not a good sign. According to tradition, it could cause a scarcity of rain. Wintering has started. Sowing has not finished and it is not raining much yet. 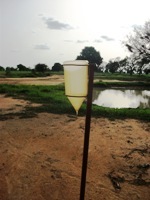 It has not rained in two weeks in some Ségou villages and this is worrying the populations. ”Yes, the weather forecast service is telling us not to worry, and that it will rain in November. It's ok, but will we wait till November to sow?” ask some peasants. They add that weeding might wait, but sowing period would be overdue. The soil is dry everywhere and that's why some farmers are staying at home waiting for rain, but others go to work even under drought. It is the scarcity of rain that is making the headlines in the villages and everybody is praying it rains. After one week without rain, Cinzana-Gare residents are beginning to smile this morning following 21mm of rain. With this peace of mind, residents of the Ségou villages were able to celebrate Eid in a happy and festive mood.